The Crabpot is a beautifully presented dog friendly holiday cottage, situated in a quiet cul de sac just a short walk to the beautiful beach at Overstrand. You can hear the sea from the garden when the tide is high. 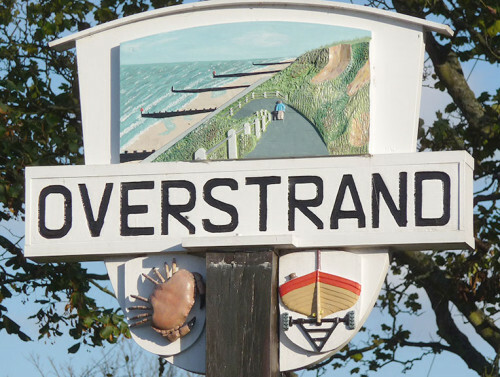 Overstrand is 2 miles from Cromer and was known in Victorian times as the Village of Millionaires and was a favourite haunt of Sir Winston Churchill. It still retains its old fashioned charm with the Cliff Top Café, sandy beach, village cricket ground, pub and lovely countryside walks. The property is equipped to a high standard. 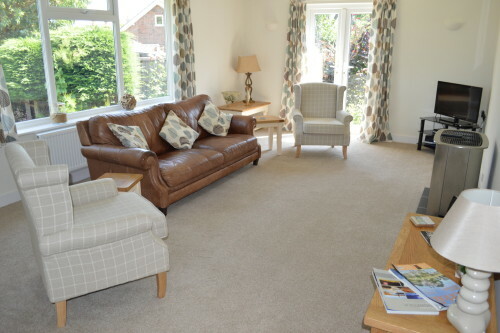 The sitting room is light with views over the pretty gardens. The sunny conservatory to the front is a perfect place to sit and read. Guests can take the train to Sheringham from Cromer or even into Norwich. Conservatory: Sunny room with comfortable chairs to sit and read in the sun or enjoy a morning coffee. selection of books. Contemporary electric wood burning effect fire, TV with Freeview, DVD player. French doors to garden. fridge freezer, microwave, toaster and washing machine. Well equipped. Iron and Ironing board, clothes airer. Table and chairs. Rear Conservatory: A useful space to take off boots, Cloakroom with WC and basin. Bathroom: family bathroom with separate shower cubicle, bath with shower tap, basin and WC. Bedroom 1: Good sized elegant bedroom with comfortable king sized bed, bedside tables and lamps, fitted wardrobe. Hairdryer. dressing table, bedside tables and lamps. The house sits at the end of a quiet cul de sac with no passing traffic, the gardens surround the house and are well planted with many different shrubs and trees. To the front is a driveway with parking for two cars, a sheltered patio area to the side with garden furniture is a good place for a bbq. BBQ provided (Bring own charcoal). To the rear is an sheltered enclosed garden with a good sized lawn.